Now, I am all for trying out new spa treatments. I've been buffed, bronzed, massaged, poked, prodded and facialed with the best of them. But when I stumbled upon this article -- originally found on my fellow beauty blogger Christina's page, Bon Bons in the Bath -- I literally gasped aloud in fear and my stomach flip-flopped. 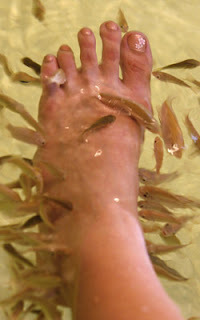 Apparently there are spas throughout the world, especially in Kuala Lumpur and throughout Turkey, called fish spas ... and while there, you stick your feet into a tank of fish who nibble off your dead skin. Tell me -- what ever happened to the good, old-fashioned way of exfoliating? Namely a pumice stone, some good sugar scrub and following that up with some rich shea-butter-infused lotion? I am seriously disturbed by this. This beauty chick is definitely going to stick with normal spa treatments. But tell me -- would you ever try this? Let me know in the comments! haha OMG disturbing indeed! Ugly Betty did an episode with Wilamina getting a pedi with these fishes! I thought it was just make believe but I can't believe it actually exists!! Yeah I think I would try it. Definitely something different! Livy, you're brave! I'm too chicken to test this out.